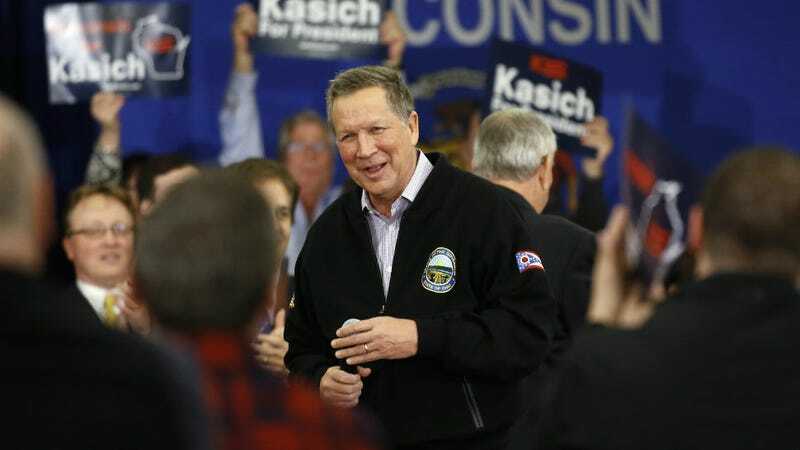 Ohio Governor John Kasich, a man who is still more or less running for president, has made what little headway he’s attained by insisting that he’s a really nice guy, the only adult in the room, the best man for the job, etc. As a New York Times story today points out, that niceness is belied by anyone who’s ever met him before this year. Or, we would add, by any woman who’s ever spoken to him. A triple-bylined piece by some of the NYT’s politics crew explores Kasich’s 2016 “aura of civility, kindness and positivity,” which includes hugs and prolix speeches about how you should take your neighborhood widow out to dinner. The John R. Kasich of 2016 is a much mellower politician than the hard-charging congressman of the 1990s, who could be so difficult that House Speaker Newt Gingrich, never known for his diplomacy, offered Mr. Kasich firm advice about his tendency to bulldoze colleagues. Although this goes unmentioned in the Times story, the myth of Nice John could also be speedily disproven by most of his public interactions with women, which range from infuriating condescension to outright dickery. Like the time he used a diet metaphor to explain the budgeting process to an adult woman. Or the time he shushed a college student with the immortal phrase “I don’t have any Taylor Swift tickets.” Or his weird 1999 campaign ad that fixated on 15-year-old girls “letting boys take advantage of you.” Or the fact that he just defunded Planned Parenthood, and has signed every anti-abortion measure that’s come across his desk for the past five years. John Kasich: a super nice dude, a moderate, a unifier, unless you’re someone who disagrees with him or someone of the wrong gender.